Google announced in late March that they had created a feature that would help connect users with relevant search results by tapping into their social network. The feature, called ‘+1’, which Google markets as being shorthand for “this is pretty cool” would operate similar to Facebook “Like” buttons, basically acting as a one-click method of adding your preferences to the websites and content one experiences on the web. 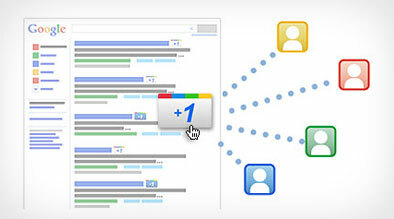 How it works: +1 utilizes what Google calls “social connections” to determine how and where the +1 results are displayed. These social connections are made up of contacts through Gmail, Twitter and FriendFeed, Google Reader and Buzz, and less defined connections of connections. Where it appears: While the experimental launch is somewhat limited, users will be able to initially see +1’s on Google search results, Google ads, or news sites. Join the experiment: By going to Google’s Labs http://www.google.com/experimental/ and clicking ‘Join the Experiment’, +1 will appear in your Google searches. In addition, a new tab under your Google will display your +1’s so your connections can see what you’ve found interesting across the web. Google has also paid attention to Facebook’s past issues over privacy and has allowed users to configure fairly strict privacy settings. The most obvious application of the +1 feature would be to treat it as Facebook’s “Like” button – adding the feature to a website or blog to grow its networking potential. While has yet to announce such an application, one can be certain that that is the direction this development will take. Perhaps a more powerful application of Google’s +1 is one which presents a unique opportunity for the hotel and hospitality industry. Especially in metro areas, +1’ing websites or content related to local attractions, things to do, or buzzworthy events (no pun intended) can connect hotel guests to those attractions or events and guide the decision-making process. Google’s launch of +1 can only help in its attempt to break Facebook’s hold on social media, but we believe that it serves as only a piece to a larger puzzle. With such a dynamic ecosystem as social media, this is not meant to be the ultimate answer to Facebook, but a preview of what’s to come.